Citation Information: J Clin Invest. 2017;127(11):4001-4017. https://doi.org/10.1172/JCI92893. Despite its central position in oncogenic intracellular signaling networks, the role of mTORC1 in epithelial development has not been studied extensively in vivo. Here, we have used the epidermis as a model system to elucidate the cellular effects and signaling feedback sequelae of mTORC1 loss of function in epithelial tissue. 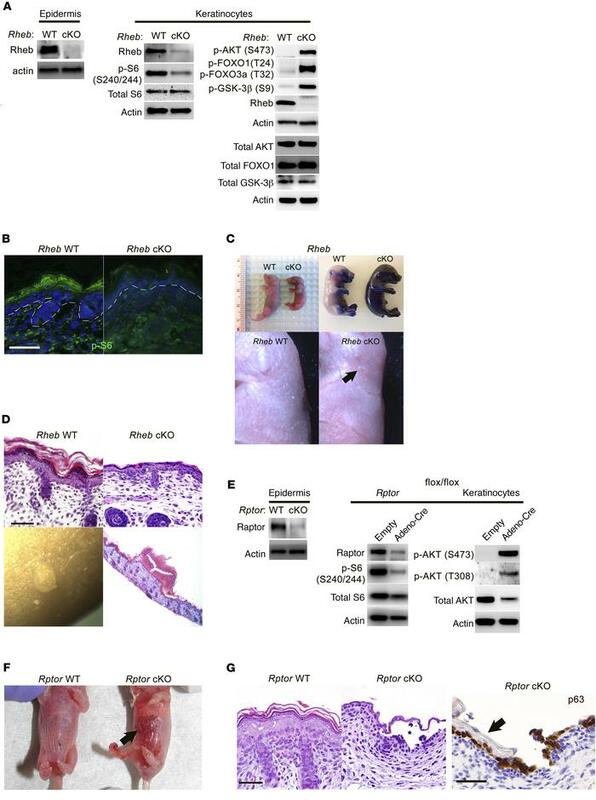 In mice with conditional epidermal loss of the mTORC1 components Rheb or Rptor, mTORC1 loss of function unexpectedly resulted in a profound skin barrier defect with epidermal abrasions, blistering, and early postnatal lethality, due to a thinned epidermis with decreased desmosomal protein expression and incomplete biochemical differentiation. In mice with mTORC1 loss of function, we found that Rho kinase (ROCK) signaling was constitutively activated, resulting in increased cytoskeletal tension and impaired cell-cell adhesion. Inhibition or silencing of ROCK1 was sufficient to rescue keratinocyte adhesion and biochemical differentiation in these mice. mTORC1 loss of function also resulted in marked feedback upregulation of upstream TGF-β signaling, triggering ROCK activity and its downstream effects on desmosomal gene expression. These findings elucidate a role for mTORC1 in the regulation of epithelial barrier formation, cytoskeletal tension, and cell adhesion, underscoring the complexity of signaling feedback following mTORC1 inhibition. Epidermal-specific mTORC1 loss-of-function models have skin barrier defects and evidence of impaired cell-cell adhesion. (A) Immunoblotting of WT and Rheb-cKO P0 epidermis and keratinocyte cultures for markers of mTORC1 (p-S6) and mTORC2 (p-AKT, p-FOXO1, p-GSK-3β) activity. Total AKT, total FOXO1, and total GSK-3β were immunoblotted separately using the same biological replicate. (B) Immunofluorescence of WT and Rheb-cKO E18.5 epidermis for p-S6. (C) Rheb-cKO pups are smaller at P0, with thin, shiny skin (top left), and fail to exclude toluidine blue dye at E18.5 (top right), consistent with an epidermal barrier defect. Grossly visible abrasions (arrow, bottom right) and a prominent vascular pattern are seen in P0 cKO epidermis. (D) Representative histologic back skin sections from Rheb-cKO P0 pups reveal markedly thinned epidermis with loss of the upper keratinizing cell layers (top right) and grossly apparent subcorneal pustules (bottom left), filled with neutrophil debris on histology (bottom right). (E) Immunoblotting of WT and Rptor-cKO P0 epidermis and WT and inducible Rptor-cKO keratinocyte cultures for markers of mTORC1 (p-S6) and mTORC2 (p-AKT) activity. (F) Rptor-cKO pups have visible epidermal blisters at P0 (right, arrow). (G) Rptor-cKO pups have a thinned epidermis by histology (right half of left panel, H&E staining) with visible blistering (denoted by an asterisk). The epidermal blisters in Rptor-cKO P0 pups are suprabasal as demonstrated by p63 immunostaining that labels basal cells left behind after superficial epidermal layers (right panel, arrow) are shed. Scale bars: 30 μm throughout.